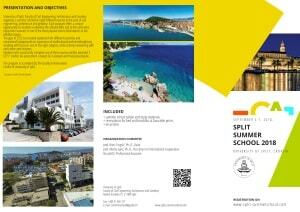 UNIVERSITY OF SPLIT - There are about 24,000 students enrolled in the University’s programs. The University of Split was officially established on 15 June 1974 when the units having already had an effect in their professional, scientific and teaching areas entered its structure. As a predominant scientific and teaching public institution in the region the University of Split has expanded during the course of the past 30 years to include eleven Faculties, one Academy of Arts and four University Departments. There are currently 1273 students enrolled in the Faculty. Until the present day the Faculty has produced 962 Bachelors of Science in Civil Engineering, 27 Bachelors of Science in Architecture, 473 Civil Engineers, 189 Bachelors of Civil Engineering, 94 Bachelors of Architecture, 129 professional Bachelors of Civil Engineering, 37 Masters of Civil Engineering, and 2 Masters of Architecture. 44 candidates have acquired a Master of Science degree and 19 candidates have acquired a Doctor of Science degree. The Faculty of Civil Engineering and Architecture performs university study of Civil Engineering, university study of Architecture, university study of Geodesy and Geo-informatics, and professional study of Civil Engineering.